OverviewRakugaki Showtime is a brawler developed by Treasure. One of its most notable characteristics is its visual style, which is made to look as though a number of things were drawn roughly in crayon. Rakugaki Showtime, game made by Treasure, the same people who made Mischief Makers for the N64. 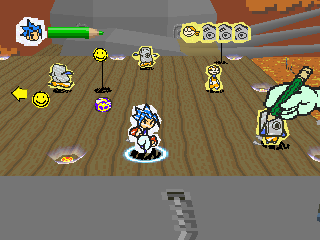 It was one of the first games in the arena fighting genre (like Poy Poy and Power Stone) and used a 3D paper-like graphical technique similar to that used in the Paper Mario series. Now you can add videos, screenshots, or other images (cover scans, disc scans, etc.) for Rakugaki Showtime (Japan) to Emuparadise. Do it now!